The Admanagerforum UK is the platform for professionals who work in in ad management, ad operations or ad technology. In the year 2002 I organized the first meeting of ad managers in Germany in order to solve the problems caused by Flash creatives. This event formed the basis for standards that are still valid today. Since that time, I regularly organised meetings with other ad managers. These unofficial meetings evolved into the official standard task force at the German IAB (“AK Adtechnology Standards im OVK im BVDW“). This group focused on creating standards for the market. The really exciting conversations happened during the coffee breaks or in the evenings, when everybody sat together for a beer after a long day of meetings. “How do you do this and that?”, “Do you also have these problems?”, “Man, I am really happy I am not alone with that.” The OVK is an exclusive group of media houses, so that the participants of the task force were limited to a small group. This made the task force very efficient. Another great experience I could make was with the Admonsters conference. The focus there lies on information exchange between experts without limiting it to a specific group of companies. Every ad manager can participate. Since my first Admonsters conference in 2003, I regularly participated and enjoyed it. Sometimes I was disappointed to meet only a few German speaking participants there. As a member of several IAB Europe task forces I also learnt that different markets in Europe also have different issues in ad management. Putting all the power of the different groups together it was just a logical consequence. 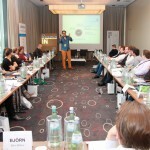 The first German Admanagerforum took place in 2011. From friends and business partners in London I often heard that it would be great to have an Admanagerforum in the UK. So we take the challenge and proudly organize the first Admanagerforum UK in June 2015. The members of the Admanagerforum are mainly leaders and decision makers in ad ops, ad management and ad technology. Our participants are specialists and top ad managers from publishers and media companies. If you are interested in participating our next event please fill in our sign up form.